(Thanks to Michael Furtman for contributing 3 beautiful photos for this quiz – All other photos by Old Naturalist). Dabbling ducks are usually found around shallow ponds. They feed with just their bill in the water or they “tip up” with the entire head underwater and the rear-end rises up. Dabbling ducks are filter feeders and they sift water through their beaks and capture aquatic (water) insects and plants, seeds, snails, and clams. 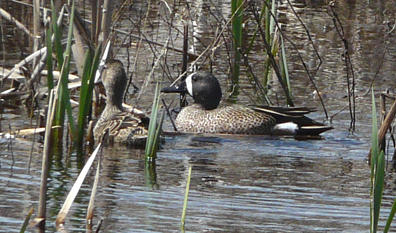 Dabbling ducks nest within a few hundred feet of water in tall grass. Most dabbling ducks breed in Minnesota, Iowa, South Dakota and North Dakota and Manitoba, Canada in what is known as the “prairie pothole” region. This refers to small glacial ponds that dot the prairie states. Diving ducks totally submerge beneath the water when they are feeding. They dive to the bottom and feed on aquatic plants, seeds, snails, small fish and crustaceans. A duck may mistakenly ingest lead shot that sunk to the bottom after it was fired from a shotgun. Unfortunately, “lead shot poisoning” was a common cause of death in diving ducks. However, lead shot has been outlawed and diving duck populations have rebounded. 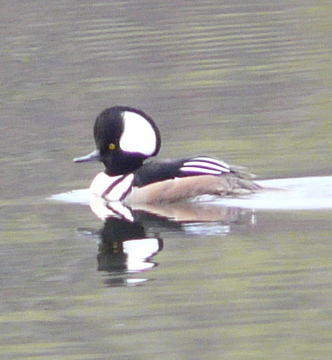 During the spring migration, divers are seen on permanent ponds and on small lakes. In the winter, they prefer saltwater bays, estuaries, and harbors. 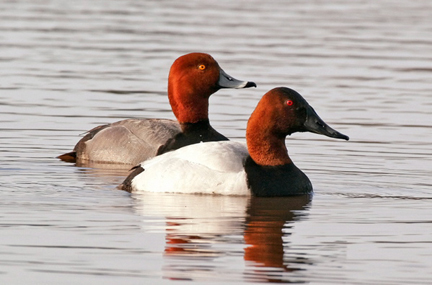 What to do: Click on the “Start” button below to take the Waterfowl Quiz. Read the description of each duck and then guess its name. This dabbling duck is also know as the American Widgeon. Its name refers to its white head which shines in the sunlight. In breeding plumage, there is a green crescent that covers the eye and goes to the back of the neck. They are often seen on uplands areas out of the water, nibbling on grasses. They often hang around smaller diving ducks and steal plant material from them when they return to the surface. This dabbling duck appears to be just another “brown female duck”. 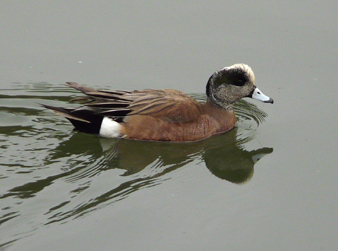 However, upon closer observation, it is a grayish-brown duck with a black rump. Its white wing patch is visible in flight. This dabbling duck is the most abundant wild duck in the world. In the spring, migrating birds appear as soon as any open water is available. They usually return to the place of their birth. This duck molts its feathers twice a year. During the summer molt, the adults cannot fly and will hide in the weeds. When the lakes begin freezing up, this duck will move south to the nearest open water. The male of this dabbling duck is easily identified by the white facial crescent bordering the bill and its bluish head. The blue on its wing is only visible during flight. During drought years, the population is harmed because the prairie potholes dry up and they are unable to raise their young. They have the longest migration of all ducks, flying as far as South America for the winter. 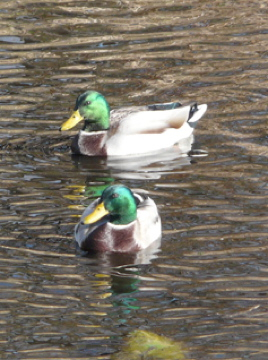 This dabbling duck, looks a lot like a mallard with its green head. Its name refers to the large flat bill that it uses to strain small critters and seeds from the water. As seen in the photo below, this species often feeds in cooperative groups. Its wintering grounds are in Mexico and Central America. 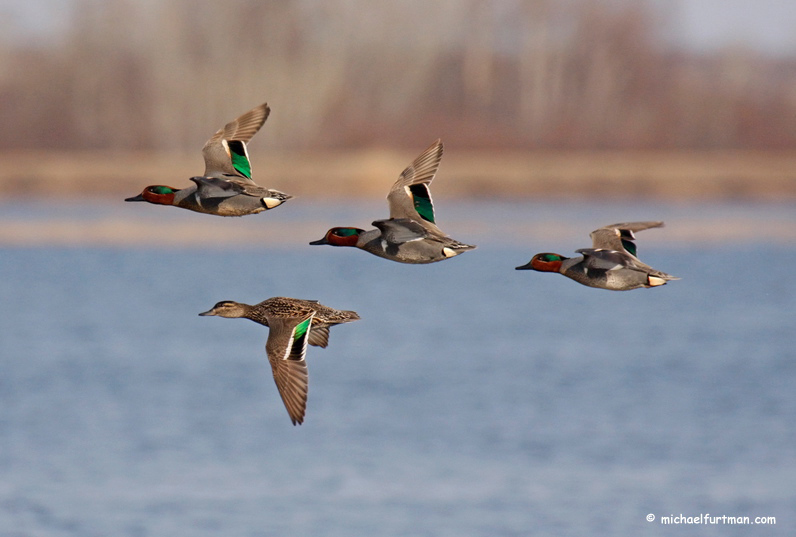 In the spring, pairs of this beautiful dabbling duck migrate north from the Southern states and Mexico. They nest in tree cavities and have long nails for perching on tree branches. In the late 1800’s, woodlands were clear-cut (completely cut) and populations were close to extinction. Conservationists (people who try to improve the environment) started making nesting boxes for the ducks and the population increased. These ducks are the smallest dabbling duck in North America and one of the fastest fliers. Unlike other dabbling ducks, they prefer permanent ponds in forest woodlands and not prairie potholes. Most nests are in brush thickets or woods and within 200 meters of water. During fall migration, they migrate to Louisiana, Texas and Central America. 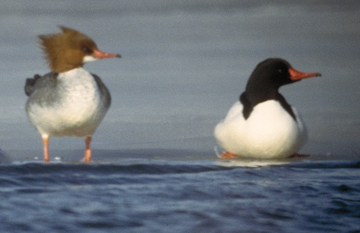 The rest of the questions in this quiz are for diving ducks. This duck migrates north when the ice is just going out of Midwestern lakes. They nest in the pothole regions of North Dakota and Canada. Within hours of hatching, the ducklings are able to dive beneath the surface. This is one of the most abundant diving duck in North America. However, their populations have steadily declined for the past 15 years. Scientists believe that toxins (poisons) in the water and "lead shot poisoning" have lead to their decline. 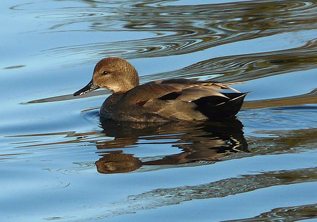 This is the smallest diving duck and the male has a crest, which can be raised and lowered. They are one of the earliest spring migrants and are seen shortly after the ice is out of northern lakes. They have serrated bills that helps them catch fish and crayfish. This bird nests in tree cavities. When the ducklings are only one day old, they leave the nest and jump to the forest floor. In this photo are two species of birds. The duck in the back is a redhead. The duck in the front is the bird that this question is directed toward. The best way to identify the duck in front is by its gently sloping beak and white back. It is a large diving duck that has been called the “aristocrat of ducks” because of its regal profile in the water. They are one of the fastest ducks and have a rapid wing beat. They nest on floating bogs over the water. This species of duck is now increasing, but was drastically affected by the loss of winter habitat and “lead shot poisoning”. It eats a variety of plants, seeds and aquatic insects. During a full moon, it is known to feed all night long. This duck is a small diving duck and are often found with other types of ducks. They are cavity nesters and use abandoned woodpecker holes. Ducklings remain in the nest for two days then jump out of the tree. Unlike most other ducks, they keep the same mate for years. 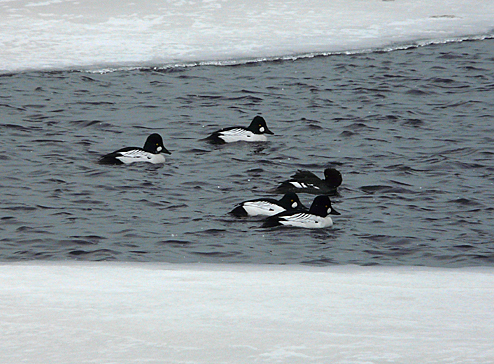 This duck is seen early in northern lakes, when the ice is just going out. 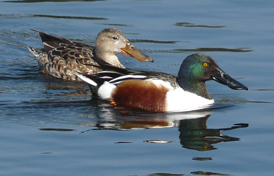 In the photo to the right, the female has the rust colored head and the male has a dark colored head. It is also called a “sawbill” because of its serrated thin bill, which is used to catch small fish. They nest in forested areas along rivers. They choose a tree cavity or nesting box and may nest in the same cavity with a wood duck. In open water/ Mid February. This diver can be seen throughout the winter if open water is available. They do not undertake a long migration, as most ducks do. Rather, they fly to the first open water and remain there. This duck nests in the cavities of trees near lakes. They are omnivorous, feeding on plant and animal material. This diver is also known as a "whistlers" because of the beautiful sound it wings make in flight. It might be time to get a bird book and learn your ducks. You know the easy ones, now start learning some of the more difficult ducks. You are almost there. 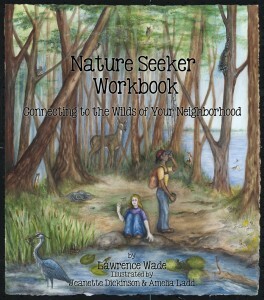 Get to a pond and start learning the waterfowl in your area. Retake the quiz and take your time. Don't rush through each question. Good Luck! You are either a hunter or a naturalist or both. Congratulations! I enjoyed this! It would be fun if you have pictures of the females and little ones, to take a quiz for those! Fun quiz! Thanks for putting it on-line! Please send us two workbooks. (For two families with grandchildren the correct age to enjoy your book) And Larry, Congratulations! A job well done! I’d like to order two books for grandchildren. Please let me know the amount and where to send.